It’s such a joy to go to work these days and I know I’m lucky to love my job this much. My office is in a great spot in the city and I have great colleagues who are wonderful to work with, and this month, I have the added bonus of having probably the best students in the world. They are the smartest, funniest and most easy-going people I know, and I get on with them, and most importantly, they get along with each other fabulously. It’s more than a pleasure to go to work, it’s an absolute joy. And for that I am thankful. 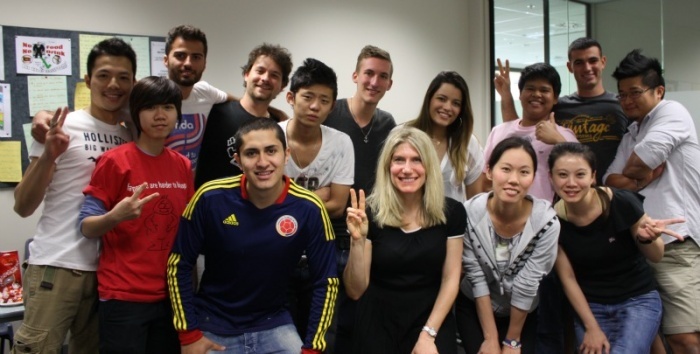 There are 13 students from 9 different countries and to see them in action is a human metaphor for international relations. Man, I love my job! This week has been both fascinating and funny as we’ve been learning about different customs and cultures. 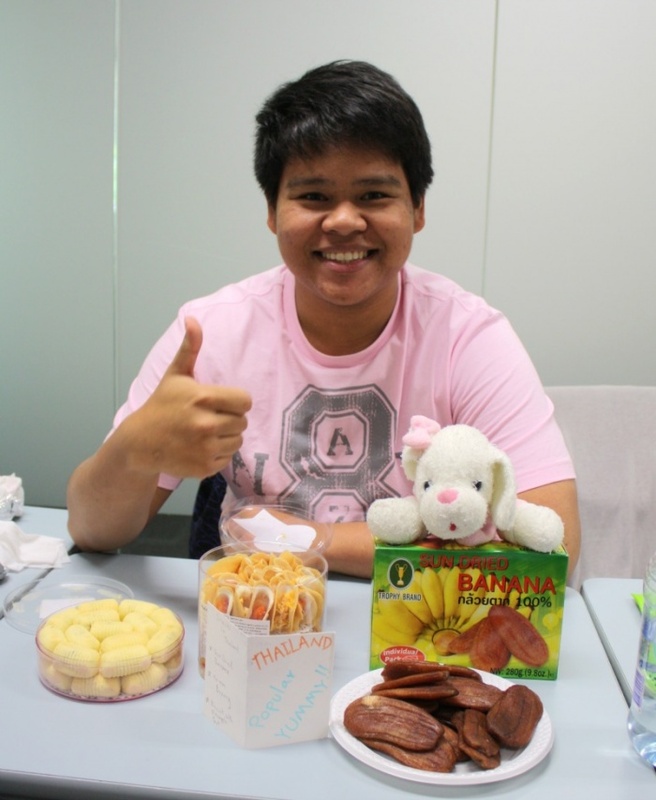 We haven’t just learned a lot more grammar and vocabulary, we’ve also learnt our classmate’s customs and cultures and it’s been positively eye opening! Of course, we have lots of things in common too, but we have enjoyed celebrating the differences. Today is the last lesson of the month and to celebrate four fabulous weeks together and to tie up our topic on customs and culture, we’re having an international food fest! I asked the students to bring in something to share, but man, they have really outdone themselves! 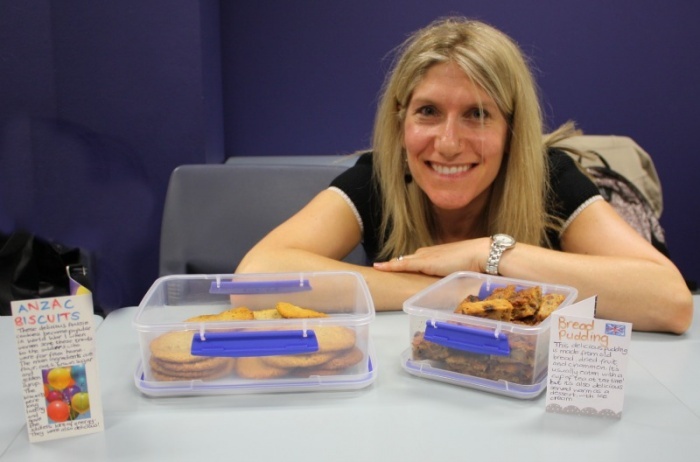 I get the ball rolling with some of Chantal’s Thermomix Anzac Biscuits and some Best Ever Bread Pudding, just like grandma used to make! I’m hedging my bets with food from England and Australia. Those cookies disappear faster than the speed of light and are a big hit with my posse. Everyone wants the recipe! 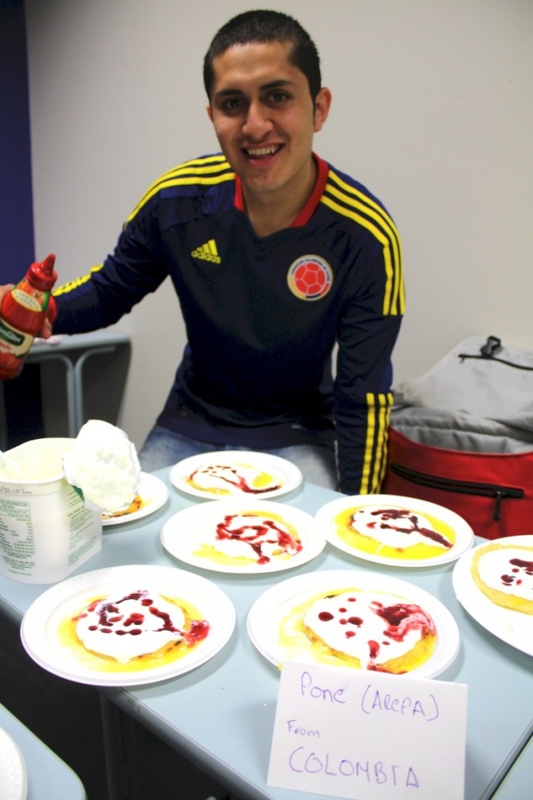 Jorge is a little late for class today, not because he overslept but because he was slaving over the stove making Colombian pancakes called Arepa Paisa. At school, he slathers them with cheese, pops them in the microwave and then tops them with vanilla yoghurt and jam! Arepa Paisa is a popular breakfast dish in Colombia and it’s easy to see why. 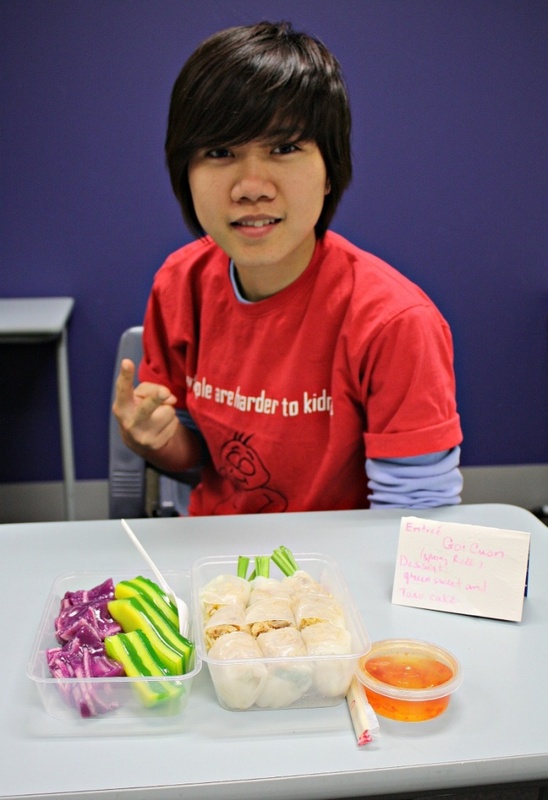 Loan bring some Vietnamese Rice Paper Rolls. They’re not home made but they might as well be, they’re that delicious. 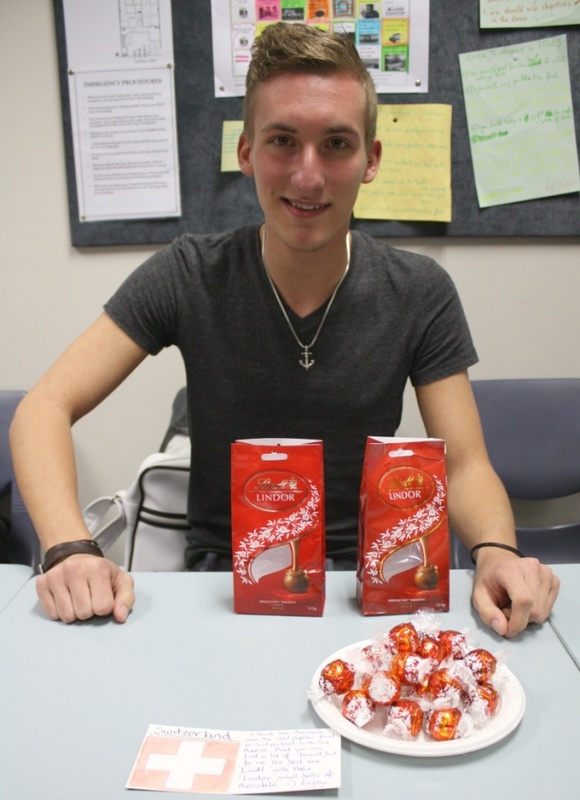 Jeremy says Switzerland is famous for it’s chocolate so he brings us some of it’s finest, Lindt. We love it! 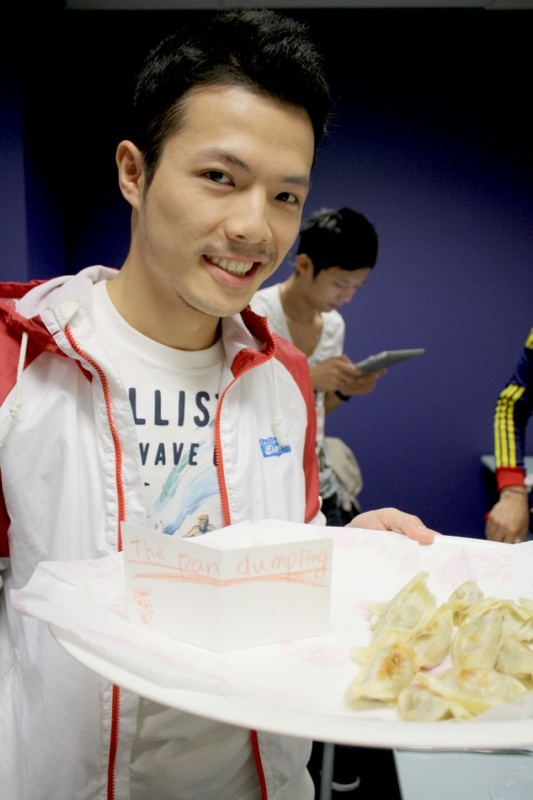 Mike brings us some Pan Dumplings from Taiwan. After two top dumpling dining out experiences in the last week, I’m on the verge of dumpling overdose, so I hold myself back. However, the students tuck in and love them! Joel has really pushed the boat out and brings in what looks like half a French boulangerie! 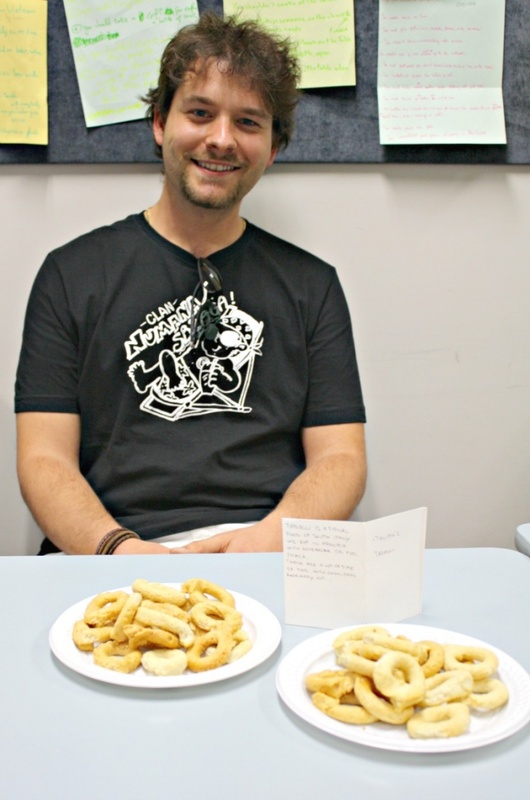 He fills a platter with big, fluffy croissants, plump pain au chocolat and sweet and sticky pain au raisisn. My mouth is watering and they taste as good as they look! 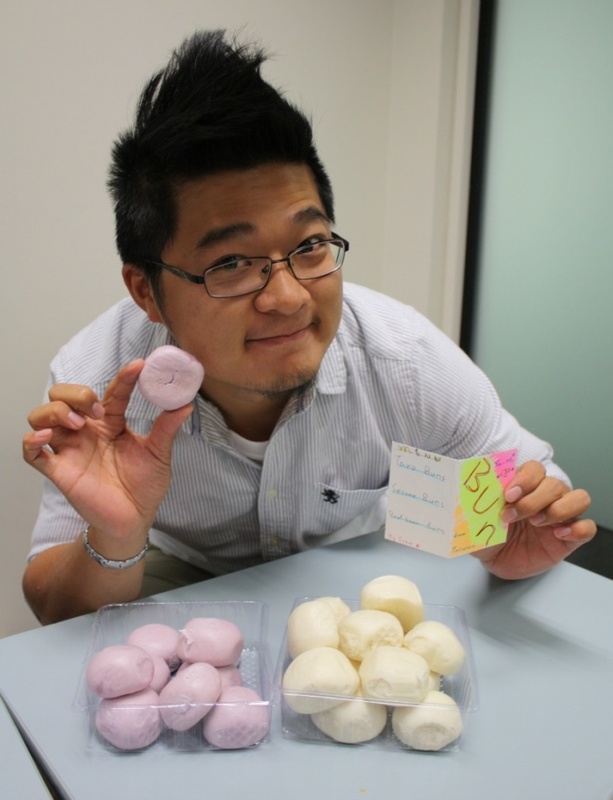 Steve brings Taiwanese buns of the red bean, taro and sesame variety. The texture is really doughy and the centre really sweet. You have to bite right into the bun to get the bready bit and the sweet stuff in the middle to really enjoy the experience. 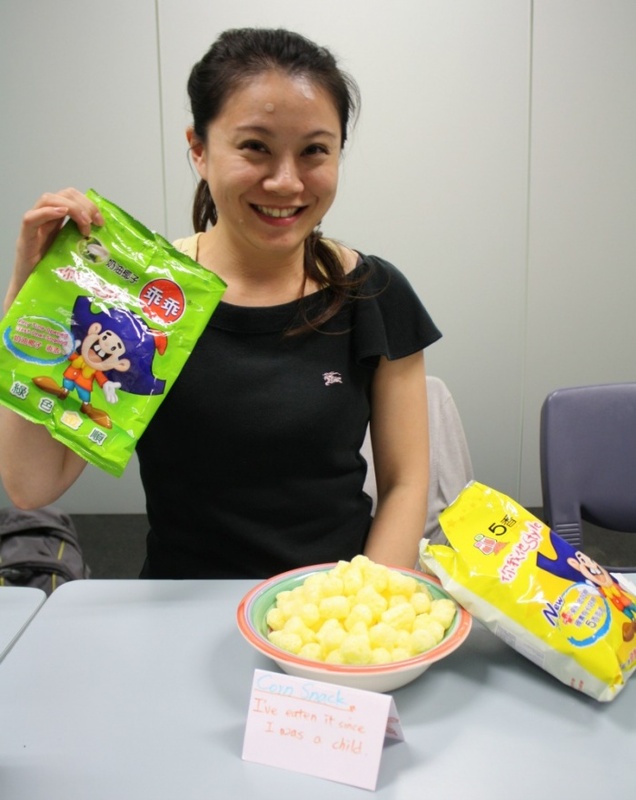 Ellen offers up some tasty Taiwanese corn snacks in two flavours. They’re scrumptious! They remind me of cheesy balls but without the cheesy flavour. I like the coconut variety, but the salty snacks get my vote! Best has provided a mini Thai banquet with some sun dried banana, some sweet ‘n; sour pineapple biscuits and some other snacks. I think with presentation like this, he could be a food stylist in the future. We were a bit worried about the bear, especially as some of us are vegetarian, but he said it was for decorating, not for eating! Phew! He says we can make sundried banana at home; by slicing the fruit and putting it out in the sun. If only everything was that easy?! Bruna also rocks up late today, but not because she missed her bus, because she burnt her dessert! She had to go shopping for supplies and make a brand new batch and still get to school! What a drama! All her hard work is worth it because her super sweet Brigadero steals the show. 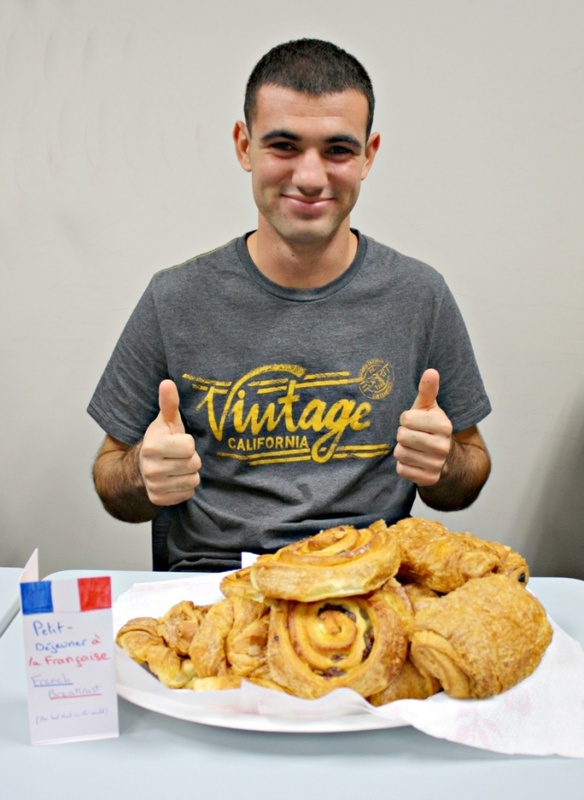 This traditional Brazilian dessert is delicious and as Garii discovers, it tastes terrific with croissants! What a cool combo! What’s more, she has promised me the recipe… coming to a blog near you soon! 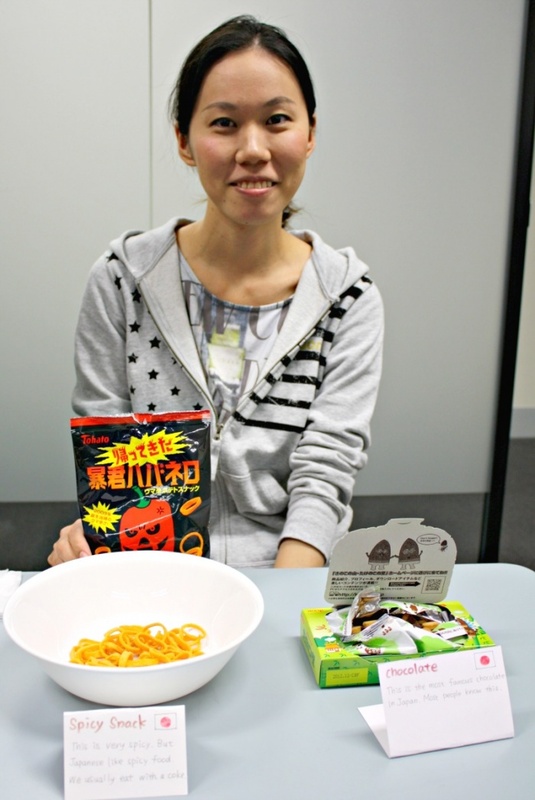 Last but not least, Michiko shares some super spicy snacks from Japan (right up my street) and some Japanese chocolate snacks. They taste so good. Garii finds it a little tricky to get Russian ingredients but he does give me his secret Blini recipe. Another one for my collection. Paula from Marketing is a champ in her role as professional photographer, she does a stirling job with some fab photos. This gives me less time to worry about my camera skills, and more time to feed my face. So thanks, Paula! You did us proud! We eat ourselves silly but there’s still loads left over. Lucky I have some sandwich bags to hand, so that everyone can take a doggy bag and have an international food feast at home. Fun, food and friends; the perfect end to a perfect month!